Like father, like … daughter. These are pretty heady times for the Rhodes family. Daughter and No. 3 hitter for the Sarasota High softball team Jade Rhodes helped lead the Sailors to a runner-up finish in the state softball tournament. The third baseman’s two-run homer in the semi-finals fueled an 8-2 victory that earned Sarasota a spot in the championship. The Herald-Tribune profiled Jade Rhodes and her big league dad earlier this month. Jade spent plenty of time with her father, who is in his 19th big league season. 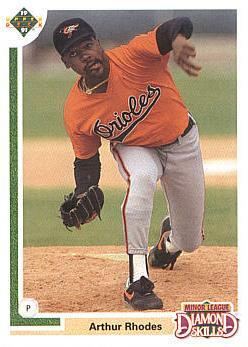 The 41-year-old Rhodes is with Cincinnati this year, his seventh major league team since debuting with Baltimore in 1991. He is 1-1 with a 0.69 earned run average in 14 games this season with the Reds and 81-63 with a 4.11 ERA in 794 career games. She said Cincinnati is the best place she has visited. Born in Sarasota, she has made stops in New Jersey, Cincinnati and West Palm Beach before returning here. Although Arthur Lee never has seen his daughter play in a Sailors’ uniform, he has taught and encouraged her along the way.